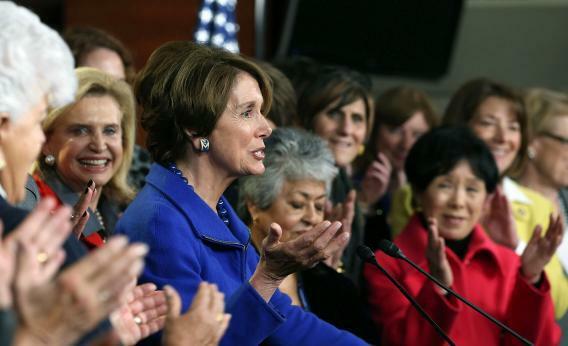 When Nancy Pelosi rolled, she rolled deep. The current minority leader of the Democrats in the House arrived at her announcement presser with most of the House’s incoming class of female members. There was Rep.-elect Tammy Duckworth wearing a star-spangled prosthetic leg. There were Kyrsten Sinema and Tulsi Gabbard, age 36 and 31, who’d be the House’s first openly bisexual member and its first Hindu member, respectively. * There was an old Pelosi ally, Rep. Jan Schakowsky, unable to find space on the stage because of the crowd. “It’s a good problem to have,” said the leader. Pelosi’s wind-up was epic. For nearly 10 minutes, she praised her fellow female members and admitted that “we want more.” She emptied the cliché-o-matic, talking about the need to “reignite the American dream” and work “for a healthy nation, a healthy political arena, a healthy planet.” Finally, after cable had cut away, she announced that she’d “made the decision that some of you might have some interest in.” She was running for leader again. Her team of women burst into cheers. In 2010 there were real questions about whether Pelosi could lead the party. Fortunately for her, there weren’t many conservative Democrats around to ask the question. Rep. Heath Shuler, a moderate Democrat from western North Carolina, challenged her on the grounds that she’d made the Democrats unelectable, and he got creamed. This year, Pelosi could point to eight Democratic gains—just 17 seats away from control of the House again. Shuler and some other Blue Dogs had been beaten or gerrymandered out of existence. Pelosi started taking questions. The first one that broached the reality—that Pelosi, for the second time, would be leading a minority—came from Luke Russert of NBC News. The women around Pelosi erupted—booing, hissing, one member snapping “discrimination!” Pelosi told Russert to ask the same question to Mitch McConnell. The women cheered. “So you’re suggesting that everyone move aside?” asked Pelosi. Pelosi comes from a political family. Her father and brother were both mayors of Baltimore. She moved to San Francisco at age 29, though, starting an independent political operation there. The idea that she would leave the leadership right after her party gained back some House seats was always a little strange. By making herself a sort of avatar of female accomplishment, he tried to make the idea sound risible. Even the new members, who hadn’t been around for Pelosi’s reign as speaker, were offended at the suggestion. Correction, Nov. 14, 2012: This post originally misspelled Tulsi Gabbard’s first name.